This is a review of Zenwise Labs Hair Growth Vitamins + DHT Blocker. The manufacturer claims this product, which contains biotin and antioxidants, will help correct nutritional deficiencies in the body to combat hair loss. By using this product they claim you will see hair which is fuller and thicker, while it promotes hair growth. 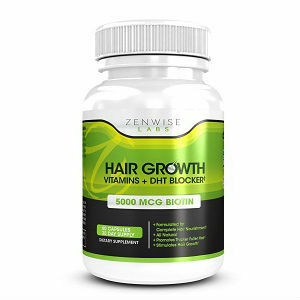 To learn more about Zenwise Labs Hair Growth Vitamins + DHT Blocker’s ingredients, guarantees and side effects to help you make a decision if this is the right product for you keep reading here. The active ingredients in Hair Growth Vitamins + DHT Blocker are the powerful oxidants, vitamins A, D, C, and E and biotin which it has 5000 mcg of. These combine to make a formula they believe will make great improvements to not only the hair but skin and nails as well. The manufacturer recommends taking one tablet twice each day, with food, to avoid upset stomach. Reported side effects include breakouts of acne, increase in appetite, and stomach upset. If you are allergic to any of the ingredients you should not take this product. Symptoms of allergic reaction are rash, dizziness, or vomiting, if you experience any of these discontinue use immediately and see your physician. A bottle of sixty tablets, which is a one month supply, costs $27.95 plus shipping and handling unless your purchases total more than $30.00, then standard shipping is free. The manufacturer gives the customers a lifetime guarantee of 100% satisfaction or your money back, less shipping and handling costs. Zenwise Labs Hair Growth Vitamins + DHT Blocker uses proven ingredients in their formula to promote hair growth. Not only do these ingredients help hair health, they help make it fuller, shinier, and thicker. The skin and nails can become healthier as well as these ingredients are known to enhance their appearance. Health overall benefits from the ingredients in this supplement. It should be noted this product is vegetarian friendly as it contains no animal products. When researching consumer feedback about half of the people who used this product were happy with the results they saw. Though not a quick fix, this product works long term to stop hair loss, especially male pattern baldness as it has DHT blockers, and can re-grow hair in most cases. The negative feedback consisted of complaints of little to no results seen. This product does not work quickly. After research it could not be found where this product is manufactured. This product runs about $30.00 a month with shipping and handling as it falls just below the amount necessary to be eligible for free shipping. John Brownstone	reviewed Zenwise Labs Hair Growth Vitamins	on August 3rd	 and gave it a rating of 3.